RED GIANT (USA) (2004). 6 wins from 1m to 1¼m, Oak Tree Clement L Hirsch Memorial Turf S., Gr.1. Sire of 221 rnrs, 135 wnrs, inc. SW Glory Days (ARC Avondale Cup, Gr.2), Surgical Strike, Platinum Command, Nova Strike, Lim's Racer, Tororosso, Red Striker, Catcha Rising Star, Puddifoot, SP Rising Shot, Quasi Folle, Snow Leopard and of Alma Gemela, Major Tom, De Kensington Oval, etc. Sire of the dams of SW Naughty Tiger and of Naughty Swagger, etc. Red Jewel Girl (f. by Red Giant). Winner. See below. SAIGON TEA (Thorn Park). 7 wins from 1400m to 2400m, NZ$9,450, A$337,960, ATC Christmas Cup, L, Horsepower Feeds & Supplements H., TAB Rewards H., TAB Early Quaddie H., Warwick Farm H., 2d VRC Swisse Wellness Trophy H., ATC TAB Rewards H.-twice, Alpha Flight Services H., Hyland Race Colours H., 3d ATC So You Think Yearlings P., Drummond Golf H., Theraces.com.au H., Hyland Race Colours H.
I Walk Alone. Winner at 2000m in 2018-19 in NZ. Masterson. 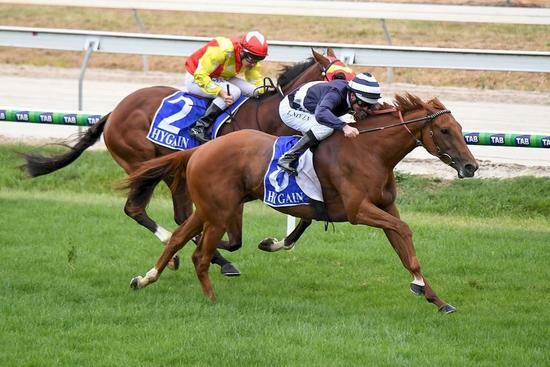 Winner at 2000m in Aust. Dolce Bella. Winner. See above. BOULEVARDOFDREAMS (Daggers Drawn). 4 wins. See above. Roman Justice. 5 wins from 1200m to 1600m, Waikato RC Alert Glass H., 2d ARC Barfoot & Thompson H.
Our Only Vice. 4 wins from 1600m to 2500m, MVRC City Festival H., 2d MVRC Guinness Have You Seen the Dark H., Koko's H.
Bosie O'Reilly. Placed at 3, 3d ATC Mightylagg Services P.
Bella Leah. 7 wins to 1100m, A$259,080, SAJC Air Diffusion Agencies H., Allan Scott Park Morphettville Flying H., Flight Centre H., Modern Home H., Schweppes H., Oakbank RC Coopers Shillabeer H., 2d SAJC Jan Grantham Memorial H., Veolia H., Adelaide Galvanising Boxing Day H., Boag's Draught H., Adelaide Cup March 14th H., SATAB Raceday H., 3d SAJC Bang & Olufsen H., Allan Scott Park Morphettville Flying H.-3 times, Boxing Day at ASPM H., Pewsey Vale H., Oakbank RC Balfours Bakery H. Producer. BI-CENTENNIAL (Karayar). 6 wins from 1600m to 2400m, STC WJ McKell Cup, L, AJC Hydrogen Welter H., Frank Dalton H., STC Padstow S., 4th Newcastle Cup, L.
Prototype (Standaan). 6 wins from 1400m to 2000m, AJC Coca-Cola H., AWA Totalisators H., 2d STC Stayers' Cup, L, AJC Robinson-Duesbury H., 3d AJC Karendi H., GP Nailon H.
Below Par (Khozaam). Winner at 1200m, 2d SAJC Out of Danger H., 3d SAJC Walter Brown S.H., L. Producer. VICTORY SMILE (Victory Dance). 8 wins from 1600m to 2400m, NZ$105,375, A$589,600, AJC Metropolitan H., Gr.1, SCTC Caloundra City Cup, L, ARC Lion Red H., Avondale JC Function Centre H., BOP RC J Swap Contractors H., Counties RC Versatile Buildings H., 2d ARC Queen Elizabeth H., Gr.2, Taranaki Cup, Gr.3, Ipswich Cup, Gr.3, Avondale JC New Zealand Bloodstock H., ARC Swiss Deli H., More FM H., Waikato RC AGC Finance 3 & 4YO H., Avondale JC Cats 'n' Jammas Cattery H., 3d Ipswich Cup, Gr.3, ARC HIH Insurance Classic, L, SCTC Caloundra City Cup, L, Whangarei Cup, 4th Whangarei RC Northland Breeders' S., L.
Winner at 1450m in 2018-19, 3d MRC (Mornington) Steller.com.au P.